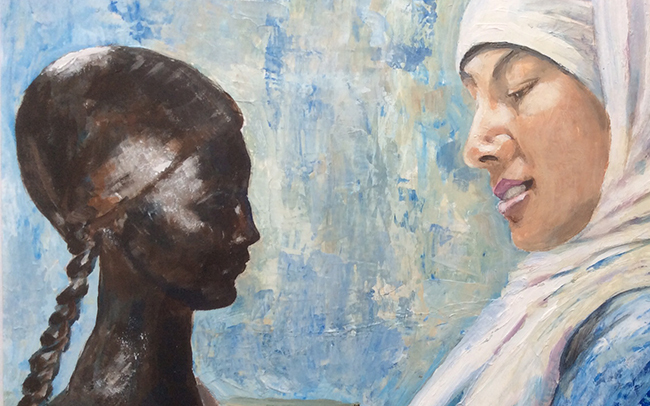 Barbara Sheard, a Kingston-based artist and teacher, was inspired to paint The Meeting following observation of an encounter between a young person and her favourite Dora Gordine artwork Head of Girl with Pigtails / Girlhood (1926-28), during a workshop at Dorich House Museum. The workshop, titled ‘My Home, My Gallery’ was part of the London 2012 Cultural Olympiad project Stories of the World and encouraged young artists from Refugee Action Kingston (RAK) to consider notions of home and habitat. It was delivered by Natalie Kay – now Participation Curator at Stanley Picker Gallery – who bumped into Barbara whilst promoting Dora at a local event, both were surprised but delighted to be meeting face to face once more! Barbara is a committee member of Thames Valley Arts Society who exhibit together regularly, including an annual showcase at Kingston Museum. She has had solo shows in Surrey and Sussex. An experienced educator, Barbara spent 20 years as a Primary teacher and is a former Kingston University employee (Teaching Practice Supervisor) within the School of Education part of Faculty of Arts and Social Sciences. Recently she introduced art curriculum and facilities for a school in St Lucia, and currently delivers ‘English through Art’ classes for ESOL groups at RAK and Hillcroft College for Women in Surbiton. The Meeting will be premiered at Stanley Picker Gallery as part of our Dora Participation Showcase, titled Shop Talk on Wednesday 25 Nov 4-7pm and we encourage all to take the opportunity to admire this delicate painting and coincidence of its ‘discovery’.